The federal government of Nigeria is composed of three distinct branches: legislative, executive and judiciary. I have heard it over and over again that the judiciary is the last hope of the common man. In many places where the executive and the legislative arms of government fall short of expectations of the people, people generally believe that the judiciary would make up for the shortcomings of the other arms of government. Whenever the legal battles to protect the rights of the common man and check dictatorship in Nigeria is mentioned, the late Gani Fawehinmi’s (SAN) name looms large. Gani not only fought against dictatorship and for the common man, he also fought for the survival of the judiciary and preservation of the integrity of the institution. Those were in the good old days. Today, the Nigeria judiciary has once again come to a crossroads where it is gasping for air. The Executive under a purported retired military general, President Muhammadu Buhari, has waged a relentless battle to overwhelm the judiciary, using the outfit of the DSS to intimidate the judiciary. The DSS' raid on some of the judicial officials under the leadership of President Buhari was an exercise intended to intimidate the judiciary. Some of the suspect judges seemed to agree that the raid was a political intimidation. The joke of the day came from Justice Binta Nyako, when she ordered, in her judgement, for the re-arrest of the IPOB Supreme Leader, Mazi Nnamdi Kanu. The world was put on notice initially when Justice Binta Nyako solicited for a ‘secret trial’ against the leader of the Indigenous People of Biafra (IPOB). The recent ruling by Binta Nyako has not made any significant headline in our newspapers because people were not expecting any good judgement the moment Justice Binta Nyako was hand-picked by President Muhammadu Buhari to handle this case. But what baffles the whole world is how can a judge revoke any bail without first investigating what led to the disappearance of the leader of the Indigenous People of Biafra (IPOB)? To answer this question, one needs to know who Justice Binta Nyako is. It is on record that Muhammadu Buhari has written several letters to Justice Binta Murtala-Nyako that her eldest son was implicated in a fraud involving her husband. The letter which was personally signed by Buhari stated that probe would commence into the activities of her son unless she jails Nnamdi Kanu. Therefore, it does not come to us as a surprise that on December 13, 2016, Justice Binta Nyako was blackmailed into delivering the ruling for the secret trial of Mazi Nnamdi Kanu. I was not surprised to read from one of the News headlines that “A Nigeria High Court has revoked bail for the leader of the Indigenous People of Biafra (IPOB)". 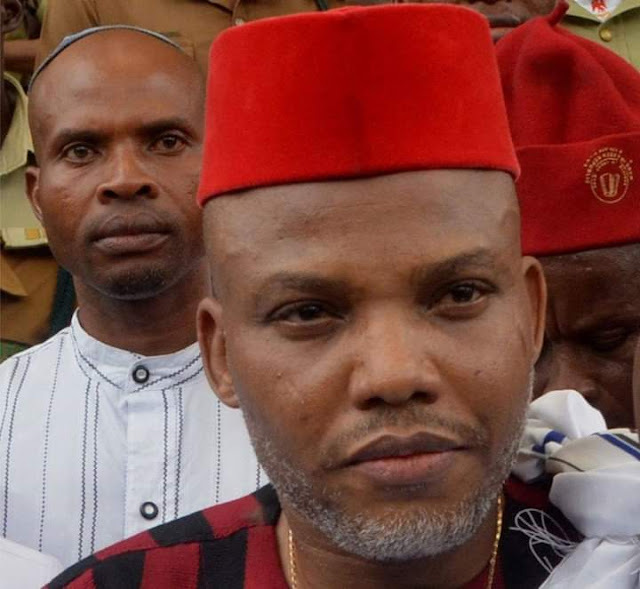 Justice Binta Nyako made the ruling on Thursday, the 28 of March 2019, saying that Mazi Nnamdi Kanu had violated bail terms. She issued a Warrant for his arrest. Mazi Nnamdi Kanu has been missing since September 2017 after his home was allegedly invaded by Nigerian army troops and 28 IPOB members were killed. Binta Nyako should rather issue orders for Buratai to explain why the military invaded Mazi Nnamdi Kanu's house. Justice Binta Nyako has decided to save her family from languishing in prison rather than preserving justice for the common man as stipulated by law. Justice has been murdered in the Nigeria judicial system. The most annoying part of this judgement is that Justice Binta Nyako has not defined the crime Mazi Nnamdi Kanu committed. It is worthy-noting that secession is not a crime in the Nigerian law. The recent judgement by Justice Binta Nyako will only lead to the promotion of Biafra restoration and the subsequent collapse of Nigeria's judicial system. Alas Biafrans! The good news is that Mazi Nnamdi Kanu has already renounced his Nigerian citizenship and he is no longer a Nigerian. Mazi Nnamdi Kanu is already under international protection and he is now designated as “untouchable”. Mazi Nnamdi Kanu is a Biafran with British citizenship.